Stillness in Motion is a hauntingly beautiful blend of lilting lyrics and instruments from across the globe that makes you feel as though you’ve stepped into another, far more relaxed and harmonious, world. 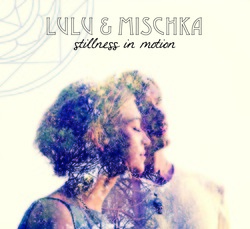 Sydney-based duo Lulu and Mischka Prem are kirtan musicians and their lyrics are chants derived from ancient mantras sung in a mix of English and Hindi. This, their first release, in collaboration with a collective of musicians, is kirtan for the modern era, however, with Lulu’s Portishead-esque voice, Mischka’s mellow timbre and the distinctly folksy feel of the backing instruments, ranging from violin to the harmonium. Lovely. The second album of the enchanting duo, Hearts Wide Open features Lulu's mellifluous voice and Mischka's relaxed vocals on 10 tracks of mantras from Vedic, Muslim, Buddhist and Sikh traditions fused with English lyrics to open the heart. Sweet trickles of love, union and peaceful vibrations are the perfect accompaniment to any yoga class or relaxation. With a guitar, a voice and humanity as inspiration, the second album Hearts Wide Open from Lulu & Mischka guids us closer to our inner light. There are mantras from Vedic, Muslim, Buddhist traditions... and we find ourselves whispering in music. Lulu's haunting voice echoes in our heart and warms it with pure and sincere joy. We explore a new sound, a new experience. Here are 2 pod cast interview from us, recorded in Finland in Oct 2015 and July 2016..
​Listen to us sharing some personal insights into our life. German article, from an interview by the local newspaper of the town where Mischka grew up. Featuring our love for each other and music.